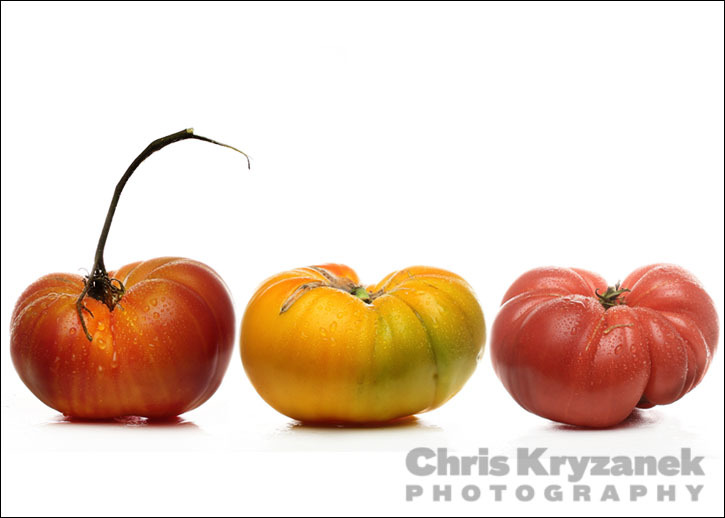 Yes, I did take this photo of these three tomatoes, but in this blog post, I'm not actually going to talk about the photo, but rather the photographer himself (me). Are all kids picky-eaters? Maybe so, and maybe not. When I was growing up there were a few things I would not eat. The interesting thing is that it wasn't because I didn't like the taste, I just didn't want to try certain foods. Tomatoes were one of those foods. Yep, ripe juicy tomatoes. It might have been the texture, or maybe it was a lack of crunch (I can't really recall). So, whenever we went out to eat as a family I remember a few phrases that I would always state: 1) "Two tacos with no tomatoes" or "A hamburger with no tomatoes". If I didn't state that in advance, I would always end up removing them or picking them off. I actually did take it one step further. Not only did I not want to eat tomatoes, I told people that I was allergic to them. I don't think I was ever questioned on what exactly would happen if I ate them, but I stuck to it. Of course I would gladly eat ketchup, pizza sauce, spaghetti sauce, salsa and many other tomato-based foods. Maybe it was the cooking heat that removed my allergy. As a teenager, perhaps I wised up, and stopped saying I was allergic to them. Now I simply stated that I didn't like them. Was it really based on not liking the taste? Nope, I still really never ate them nor had a bad experience while eating them, I just didn't eat them because of avoiding them when I was younger. Prior to becoming a adult, I started to open up my pallet and stopped excluding them when eating tacos. Impressive bravery (I know). I didn't suddenly feel like I had been missing out for years, but I did start to appreciate tomatoes more. Now, I'm not hesitant to order a hamburger with tomatoes, a BLT, or other foods that have them as common toppings. However, when I was given these homegrown tomatoes, my first instinct was to photograph them (rather than eat them). That certainly would not be the case if someone gave me a bacon cheeseburger.